Examine the most diverse and comprehensive coverage of medical conditions related to the outdoors. Be guided through logical and complete explanations of every topic. Enhance your understanding with descriptive material including numerous drawings and instructions. Research recommendations for injury and illness prevention. Locate answers quickly with a helpful comprehensive index. Dr. Paul S. Auerbach, FACEP, FAWM, is the Redlich Family Professor of Surgery in the Division of Emergency Medicine at Stanford University School of Medicine. He is the world's leading expert on wilderness medicine and a prolific author. 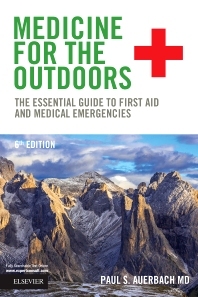 He is the Editor of Wilderness Medicine, and author of Medicine for the Outdoors and Field Guide to Wilderness Medicine. Dr. Auerbach holds his MD from Duke and completed his internship at Dartmouth and residency at UCLA. He is certified by the American Board of Emergency Medicine. He has been recognized as a Hero of Emergency Medicine by the American College of Emergency Physicians and received the New Orleans Grand Isle Award for Science from the Academy of Underwater Arts and Sciences, the Founders Award from the Wilderness Medical Society, and the Outstanding Contribution in Education Award from the American College of Emergency Physicians, among others. Dr. Auerbach has served as a volunteer physician in Haiti, Nepal, and Guatemala.